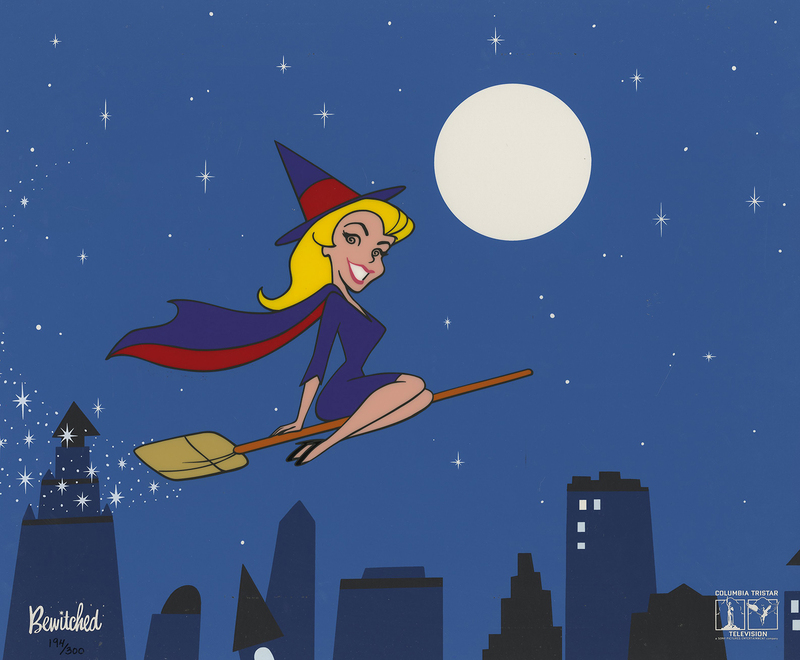 13.5" x 16.5",7" x 8.5"
This is a hand-painted limited edition featuring imagery from the opening titles of the hit live-action TV show, Bewitched. 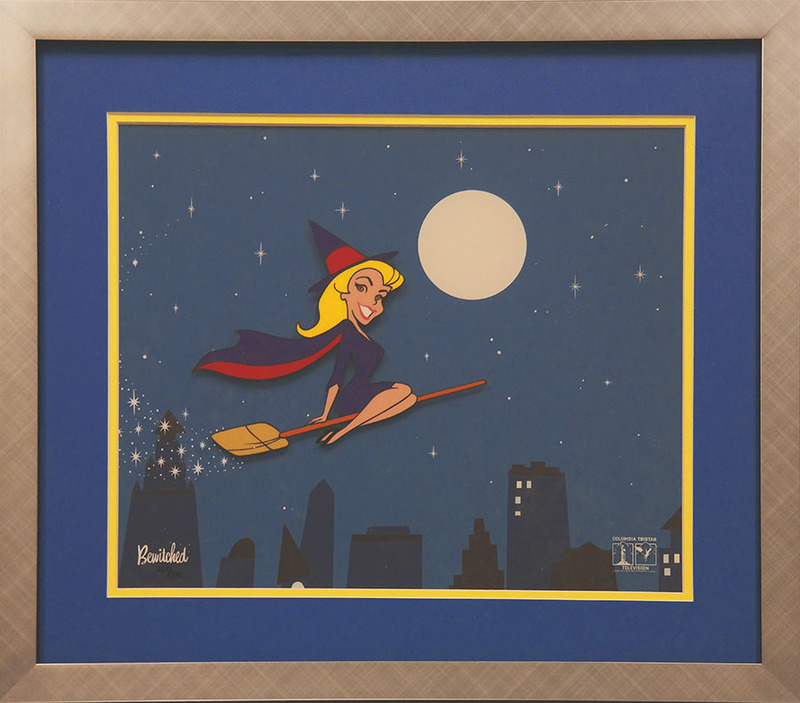 The image is one in a series of special hand-painted limited edition cels developed to commemorate the opening title of the acclaimed television series. This image was created from the actual opening sequence. This scene captures SAmantha in her element and all her beauty, as she sweeps across the sky. The cel line work was serigraphed based on a drawing recreated from the original animation. The stars in the image are also serigraphed onto the cel as well. The main image of Samantha was hand-painted on the reverse side, as in traditional cel animation. The background is a lithographically printed reproduction of the original imagery. 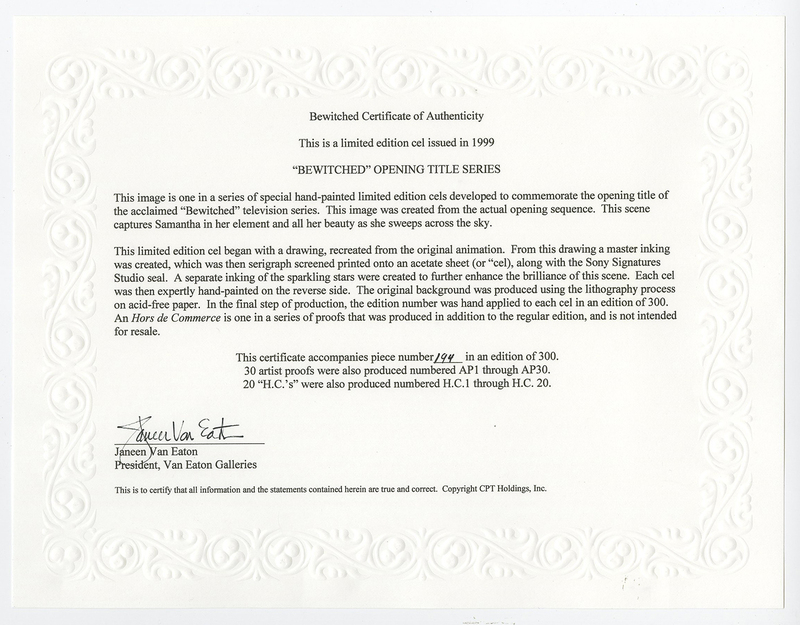 Each cel is hand numbered and features a studio seal and the original studio COA. The overall piece measures 14.5" x 17.5, with the overall image measuring 13.5" x 16.5", and Samantha's image measuring 7" x 8.5". The image represents a stock image, so the actual limited edition number you receive may differ from the one in the imagery. This piece is also available with the custom professional framing as shown in the last reference photo. Please call for pricing and a shipping quote for framed artwork, 818-788-2357.